DRIVING DIRECTIONS to Bobbitt’s Hole from I-85: take Exit 173, Cole Mill Road. Head north on Cole Mill Rd. away from Hillsborough Rd. In 3 miles, you will cross the Eno River. Take the next left onto Old Cole Mill Rd. This is the Cole Mill Access of Eno River State Park. The physical address is 4300 Old Cole Mill Road, Durham NC 27712; if this address does not appear in your GPS, then use this intersection—Eno Woods Trail and Old Cole Mill Road. The park will be straight ahead on Old Cole Mill Rd. DRIVING DIRECTIONS to Bobbitt’s Hole from 147 N & 15/501 N: take Exit 16A off 147 N or Exit 108D off 15/501 N. The exit ramp for 147 will merge into Exit 108D, stay in your lane. If you are coming from 15/501, get in the right lane. As you are coming up the exit ramp, stay in one of the two left lanes. At the top of the ramp, turn left onto Hillsborough Road. In 0.3 miles, at the second stoplight from the exit, turn right onto Cole Mill Road. In 3 miles, you will cross the Eno River. Take the next left onto Old Cole Mill Rd. This is the Cole Mill Access of Eno River State Park. The physical address is 4300 Old Cole Mill Road, Durham NC 27712; if this address does not appear in your GPS, then use this intersection—Eno Woods Trail and Old Cole Mill Road. The park will be straight ahead on Old Cole Mill Rd. HIKING DIRECTIONS to Bobbitt’s Hole: From where you park at the Cole Mill Access, walk along the parking lot toward the river. When you reach the end of the paved access, you will see a wayside display overlooking the river. Turn right and take the Cole Mill Trail (blazed with yellow dots) along the river until it intersects with the Bobbitt Hole Trail (blazed with red dots). 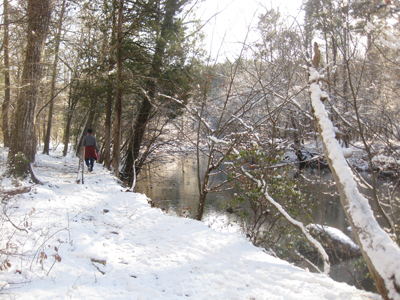 Continue along the river on the Bobbitt Hole Trail, then follow the spur trail to reach the hole. This round trip hike along the river is approximately 2.75 miles. Not much is known about the history of Bobbitt’s Hole, nor has much been written about the geologic features that cause the hole. But, one thing is certain, it is a beautiful gem all year long and a great hike along the Eno! At the beginning of the hike, when you are standing at the wayside display, imagine a single-lane steel truss bridge spanning the Eno. This is the old river crossing for the second edition of Cole Mill Road. On the far side of the river stood the McCown Mill (later Cole Mill), which was in operation from 1814-1908. The mill was started using money provided by John Cabe to his fifth daughter Rachel and her husband Moses. When you first reach the edge of the river on the Cole Mill Trail, look for a large rock outcrop on the other side of the river; it provided a footing for the mill dam that ran across the river just above the riffle you see. As you hike along the river, you will discover beautiful patches of rhododendron and mountain laurel on the shady north-facing slopes of the opposite riverbank. This same side of the river also has the remains of the Alpha Woolen Mills and the foundation of a cabin that was said to be an off-campus party house for one of Duke University’s fraternities. 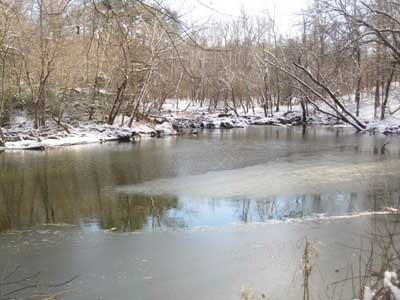 Bobbitt’s Hole was a popular swimming hole, being one of the deepest spots on the river. If you want to explore more of this area of Eno River State Park, then you should stay the night at one of the five backcountry campsites in the Piper Creek Campground. Have you been there? We are having a contest to see who can make it to all 12 locations in 2014. If you go, bring a camera and upload a photo to our Flickr photostream. Tag your photo as “Hidden Gems of the Eno” (you must use quotes around it!) and be sure to title each photo with your first name and last initial. Send an email to calendar@enoriver.org to let us know you are participating in the contest. We will honor those who make it to all of the locations at our annual calendar celebration at the end of the year and give you a special gift!